Troop Scale: 1 Infantry unit = 1000 men, 1 Cavalry unit = 600 men, 1 Artillery = 8 - 12 guns. Background: Prince Eugene and his Army of Italy have returned to the offensive after an initial defeat at the opening of the campaign at Sacile. The defeat of the Austrian Hauptarmee has necessitated the gradual withdrawal of the Austrian army of Erzherzog Johann. Eugene's army is attempting to cross the shallow but broad river Piave. The Austrians have burned all the bridges, but there are still three fords which can be used to cross the river. However, each day the melting of snow in the Alps makes the river rise progressively as the day goes on, sometimes dramatically so! The Austrian surveillance was very lax, and the initial crossing got under way with many men crossing naked, holding their clothes and muskets over their heads, and then dressing on the far bank. It was a bold but inherently risky move, but Eugene was eager to redeem himself in the eyes of his Imperial father in law! Map: the River Piave is unfordable except at the three marked fords 4” wide, which are Class II terrain; the river may be crossed in Attack or March Column formations (also special scenario rules for the rising waters). The Piavisella stream is Class II, as is the dike. The villages are Class II terrain. Scenario Rules: Add two Sapper Task cards to the French Sequence Deck (Use blank cards or some other non standard card). There is no impetus cost to turn this card, but upon its appearance, the French C-In C rolls his LD against the Austrian C-in-C's LD in the same fashion as for a Lull. If the French roll is higher, then a section of bridge has been completed at Priula; if and when three sections are completed, then the bridge is ready for use by all arms. Rising Waters: The battle begins at 8AM. Starting with the 4th French MOVE card, the Austrian player rolls a D12. If the score is less than the number of French MOVE cards turned to date, then the water has risen to the point where the river is no longer fordable; however bridging operations may continue, and thereafter, on each Sapper task Card one unit may cross each of the existing fords by boats. Continue to roll an Austrian D12 on each subsequent appearance of French MOVE cards; if the score exceeds the number of French MOVE cards turned thus far, then bridging operations must cease, but Ferrying on Sapper Task cards as above may continue. Continue the Austrian D12 roll for subsequent French MOVE cards, and if the score is once again less than the number of French MOVE cards turned thus far, then the current has become too swift, and even these ferrying operations must cease. Deployment: As shown on the map (the artillery of Broussier's and Lamarque's divisions are deployed in a battery along the river to their left). However, only the Austrian Rearguard may act on the first Austrian MOVE card. Reinforcements: Waiting behind the Priula Ford (middle ford) are the troops of Baraguey's Corps, which may enter at any time, and similarly the remaining troops of Grenier's Corps my enter behind the San Nichiol Ford (on the French right) at any time. Victory Conditions: If the Austrian Army breaks from Army Morale, the French win a Major Victory – Decisive if more than 1/3 of the Austrian units are routed or destroyed. If the French break from Army Morale, the Austrians win a Decisive Victory. If the Austrians end the battle with more Morale Points than the French, they win a Major Victory if the French are at zero Morale Points, otherwise Minor. If he French end the battle with more Morale Points than the Austrians, they win a Minor Victory if the Austrians are at zero Morale Points, otherwise battle is a draw. The game will end after the 9th French MOVE card, if not before (5PM). This scenario makes good use of the flexibility of the Piquet/Filed of Battle system, I think. It is based upon the accounts and OOB in Gill's Thunder on the Danube and also Epstein's Prince Eugene at War:1809. It is said that a rising tide carries all boats with it - we will see if this is the case on the Piave this time! 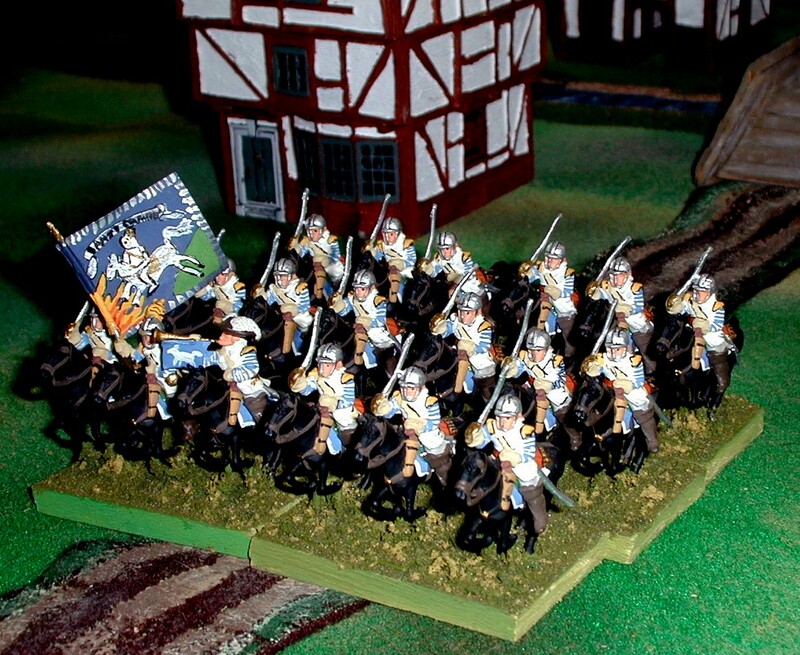 Continuing on through my vintage 1970's ear 25mm Minifigs English Civil War armies, next up are two regiments of Parliamentarian Horse. The first unit is Sir William Tirrell's Regiment of Horse (also spelled Tyrrell, and the same name in the US Terrell, and other variants). The regiment wears white coats with stylish adornments (yellow wings and blue rings on the sleeves of their jackets). The flag is a historical one, and was carried by this regiment specifically. It is illustrated in the Almark book "The English Civil War" by R. Potter and G. A. Ebleton (1973). The scroll reads "Sanes Craindre", which as best as I can tell, means "Nothing to Fear", and the aloof countenance of the rider seems almost akin to the image accompanying the Fool in the Trumps Major of a Tarot deck! A stylish regiment, their saddle blankets being light blue with white trim - purely whimsy on my part... a bit reminiscent of the later French Carabiniers of the Napoleonic Wars! Their orange tawny sashes mark them as Parliamentarians for sure! 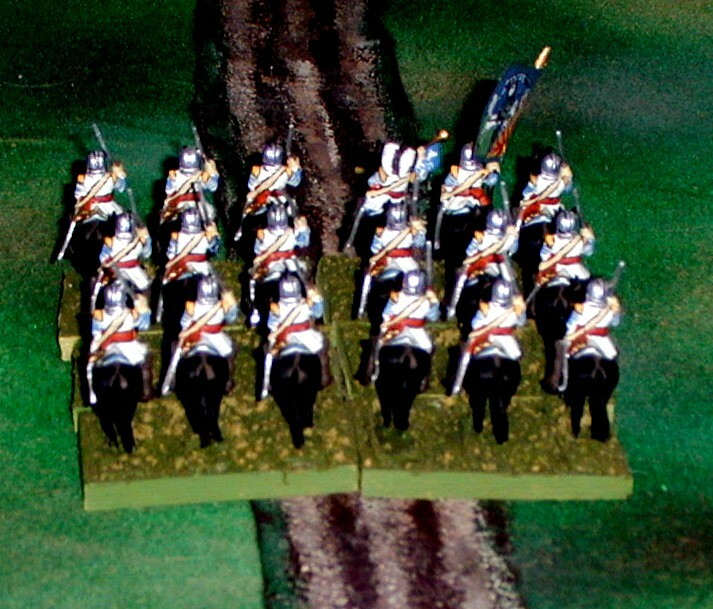 I have this regiment mounted on the narrower bases originally called for by George Gush's Renaissance rules for "trotters (cavalry relying more on their Pistols than their swords). This regiment of "Lobsters" (men wearing 3/4 armor, or Cuirassiers in European parlance of the time) was raised by Sir Arthur Haselrig early in the course of the English Civil War.The flag is historical; the inscription reads "Only in Heaven"
Sir Arthur had good reason to raise troops to oppose King Charles I; he was one of the "Five Members" o f Parliament that King Charles attempted to arrest for treason in January 1642, thus provoking the Civil War itself. The regiment was said to be 550 men strong, and fought at Edgehill, Landsdowne, Roundway Down, and Cheriton. Once again, the orange sashes certainly mark the unit as Parliamentarian! Haselrig was a staunch Republican, and after initially supporting Cromwell, subsequently came to oppose him, and later Lambert. Upon the Restoration of Charles II, General Mock intervened upon his behalf preventing his execution, but he was imprisoned in the Tower of London and died there in 1661. It is more than a bit ironic that his regiment was then taken up into Royal service, becoming the Oxford Blues after the color of their coats. Eventually, that regiment became the Royal Horse Guard Blues in 1750. As usual, history is stranger than fiction! My first two years of Medical School saw very little gaming, especially the first year. Not that there is anything surprising about that when you have classes from 8AM to 5PM Monday through Friday, and 8-12 on Saturday as well. During the brief times when I was home on vacation, I still got together with the hometown crew, chiefly for D&D, and later our new Sweet-inspired Ancients rules. Like most medical students, I think, I found these years a bit depressing; you are just about literally force fed a tremendous amount of information that it is absolutely impossible to really master. Is there any physician out there with *good* memories of learning the damned Krebs Cycle and related esoterica? You can do it, otherwise you wouldn't have been accepted in the first place, but many, including myself, start to wonder if you really made the right choice. I also found that I really didn't care much for about 80% of my medical school class of 80 students; I really can't fully explain it, but so it was. Indeed, many years later I attended my 25th class reunion, along with my wife. I had an OK time, but commented to her afterwards, knowing that the few people I would have enjoyed seeing wouldn't be there, "OK yeah, now I remember - I didn't really like most of these guys much back then, either! The four of us who had been UConn undergrads all got along well; three of us were Chemistry majors, and one, John, was also a fellow Marching Band and Band Fraternity (Kappa Kappa Psi) member, and my closest friend in the class; not a gamer at all, though. That year also saw two of the biggest snowstorms in Connecticut history, closing down the highways for several days not once but twice (four wheel drive vehicles were rare in those days); the first one actually resulted in our end of term exams being rescheduled. The second storm placed so much snow on the roof of the Hartford Coliseum that it actually collapsed! Fortunately, it was very early in the morning, and no one was inside. My good friend from college, Tom, was then working in Hartford, having gotten a jopb with Price Waterhouse, one of the (then) Big Ten national Accounting firms. He was commuting from an hour away, so he got stuck in the city during the second storm, and stayed overnight with me for a day or two while we waited for the snow to be cleared away. In the course of the visit, we were sitting in my living room, and Tom observed a large plastic baggie containing a non-descript green/yellow/brown mixture. Now, understand that both of us were relatively liberal politically, but personally quite conservative with regard to our own lives and conduct. "Peter, not you too? ", he inquired, obviously thinking the bag contained some kind of "funky herbs". I was a bit perplexed at first, and then I realized what he was referring to. I laughed and said something like "Not hardly! ", and showed him it was the flocking mixture for my bases! Good thing it wasn't a cop, I suppose, LOL! Even better that no one tried smoking the Woodlands Scenics flock! Anyway, the one good thing was that at the end of the first year, they gave us four weeks off to study for part I of the National Board exam. Now, I knew myself well enough to know that anything that I hadn't learned already that I reviewed more than 2 weeks before the test was pretty much a waste of time. So, I used the first 2 weeks of to paint non stop! :-) Most of my first Ancient army, using the new (and still quite excellent castings, even by today's standards) 25mm Minifigs Assyrians, was completed in that time. I was living alone in an apartment in Hartford, and since no one I knew would see more for a month, I decided to also use the time to try growing a moustache. I was pretty sure I wouldn't like it, but I figured what the heck, now's the time if ever. I was right; after 4 weeks, I had a fuzzy looking upper lip that did nothing for me at all, so off it came, bzzzzt, LOL! We did have the first summer off after exams, so I returned home and worked for Union Carbide for the summer, doing some quality control work for their clinical chemistry anaylzers. That was interesting, and they guys I worked with in the lab were a lot of fun. It also taught me not to accept those nice neat numbers that labs spit out as carved in stone, a lesson which has served me well more than a few times over the years. I got in a decent amount of gaming with my old crew over the summer, as well as painting my second Ancient army, Carthagenians. again 25mm Minifigs. Most of our limited gaming during this time was done using our Sweet and Legion! inspired fast Ancients Rules; we originally played them on a hex gridded table, but they should work fine using a Table with a 3" square grid as well (for 25mm figures, mostly mounted on 60mm frontage stands). The rules are very ,uch of the "Rock, Paper Scissors Type", being ultimaterly inspired by the WRG Ancients (? 3rd or 4th edition by this time)., which I played a few times but found too fussy for my tastes... plus those reactions tests; way too time consuming for what usually resulted in "Carry on as Ordered". This Minifig Sassanid Persian Army was one of the ones I painted during this time. A) A turn consists of both players firing with all eligible units, then player 1 moves all of his units that he desires, then melees are fought. Both players then fire again, player 2 moves all of his units that he desires, then melees are fought. Repeat this sequence next turn. B) same as above, except that at the start of each turn, both players roll a D10; the winner chooses whether to move first or second that turn; re-roll ties. For the purpose of game mechanics, all units except engines are considered to have two stands, each one of which can take 2, 3, or 4 hits. 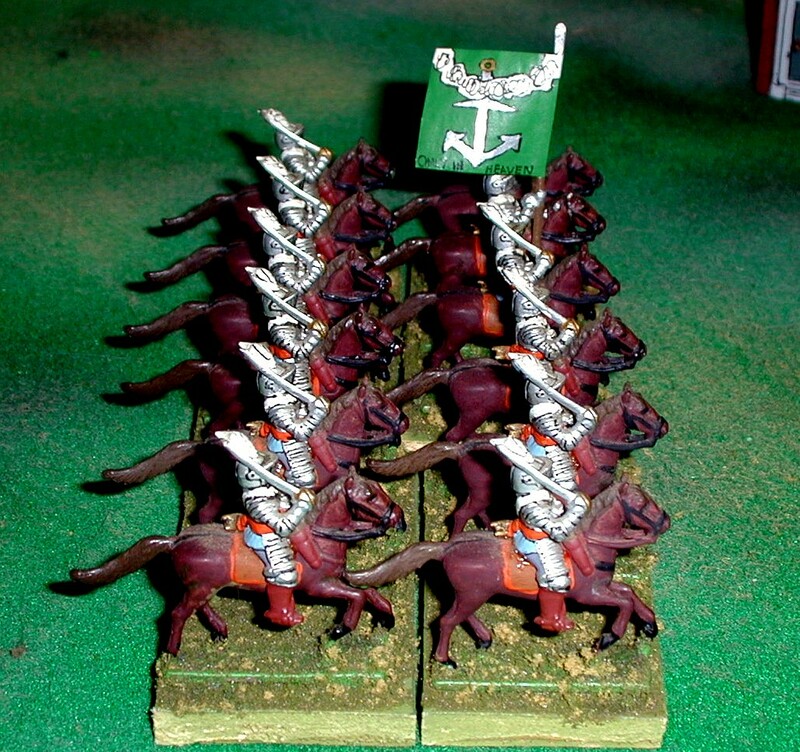 Some units will only have 1 stand physically (Heavy Chariots) due the size of the models, but are still considered to have two stands for the purpose of game mechanics, a stand being lost when the unit has reached 50% casualties. All movement is strictly by squares (or hexes). Movement must be in the direction faced, +/- 45 degrees (60 degrees for hexes). Changes of facing cost 1/2 sqare (1 hex) for each 45 dgrees (60 degrees for hexes) turned. Moves along the diagonal for squared grids cost 1.5 squares. Only one friendly unit may occupy a square (hex) at a time, but all freindly units may freely interpenetrate one another without penalty, except retreating elephants. LI, LMI, LHI, LC, LCam and LCh may form skirmish order. ( 1 stand to each of two squares (hexes), adajacent if at all possible; this costs two squares (hexes) to form, and also two to recover from back into formed order. Skirmishing stands MUST retreat a full half move (round up) if attacked by formed troops, or be destroyed. They re also destroyed if attacked despite having already made such a retreat. The retreat my be in any direction away from the attackers; they do not change facing as a result of the retreat. 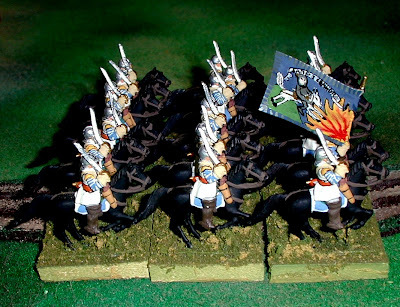 retreating skirmishers may fall back through their own troops without penalty, and may add an extra square (hex) to their retrograde movement if the half move is insufficient to get them clear. If however, this is still inadequate, the stand is destroyed instead. Skirmnishing troops attacked by other skirmish order troops may elect to either make a retreat as above, or to stand and fight. All units fall back at 1/2 speed - round up. Add one square (hex) if entire move made on Roads - 2 if Chariots. Costs 2 squares (hexes) to form or recover from Skirmish. Each infantry unit with missile weapons may fire at any target within range along a line of sight within +/_ 45 degrees (60 degrees for hexes) of their front, +/- 90 degrees for skirmishers. Elephants hAVE A 360 degree field of fire. Chariots may fire everywhere exept directly to their rear, =/- 45 degrees (60 deg for hexes). 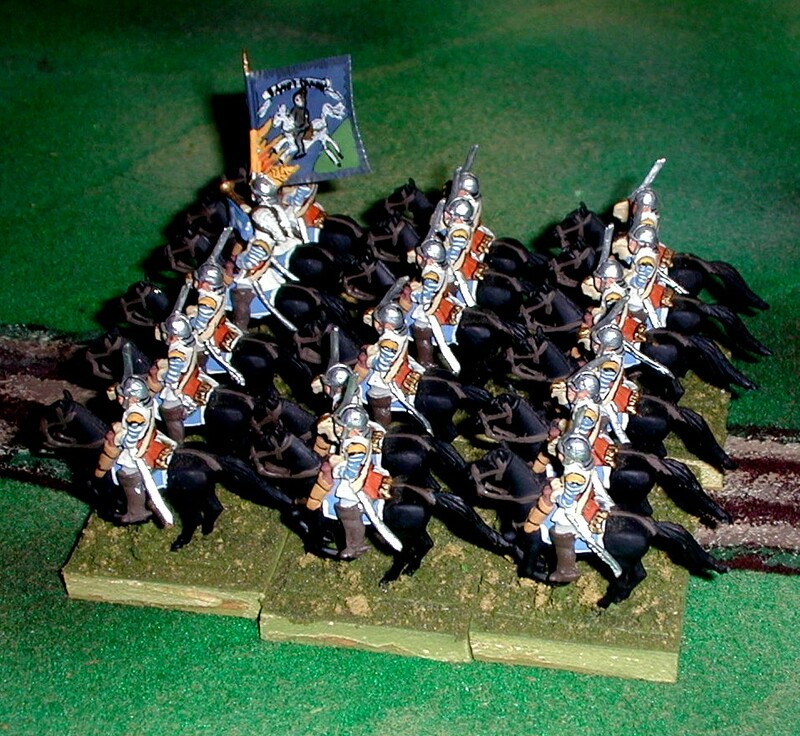 Formed cavalry may fire 45 degrees (60 for hexes) to their right, and 135 degrees (hexes 120 degrees) to their left. 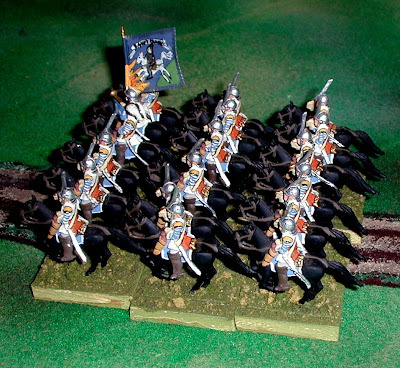 Skirmish cavalry may fire 90 degrees to their right and 135 degrees (120 deg for hexes) to their left. Units on hills may fire overhead, and be fired at overhead, providing they are otherwise eligible. Any other unit with a friendly unit in the square (hex) directly in front of it may NOT fire. 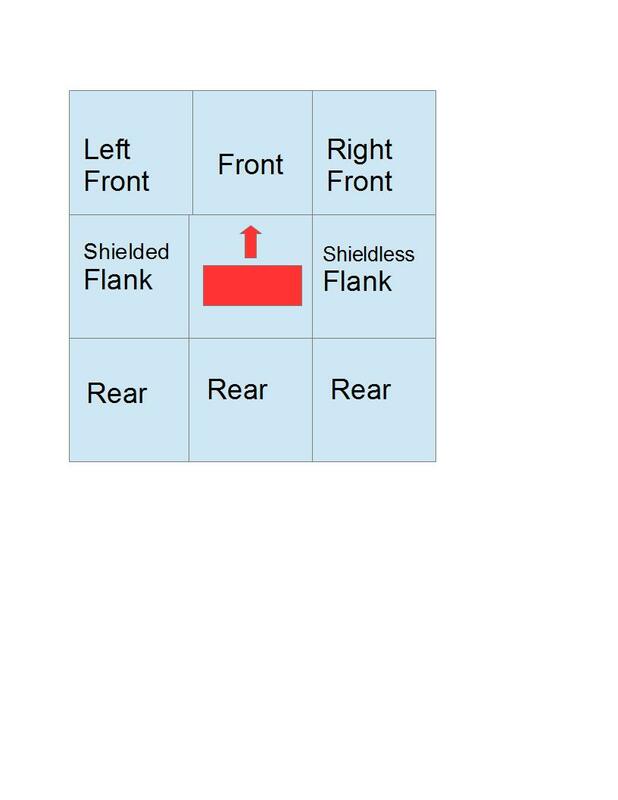 To fire, each STAND rolls %tile dice; if the roll is less than or equal to the units modified missile factor, a hit is scored on the target. Minimum factor is 5% after modifiers. NOTE: EHC count as a SHC target from front zones, but HC target from flanks and rear! * Firers shooting into the rear or shieldless flank of their target count them as Shieldless, even if the target carries shields, but ENG, El, HCh. LCh, and SHC are never considered shieldless. Engines fire in a completely different fashion. An actual shooting catapult device is placed anywhere behind the engine stand, and a clay disc is fired. Overhead fire is allowed. A target within 1" of the center of the disc which is also in the engine's field of fire, and in range is hit. If two or more targets are within 1", then the shooter has his choice which takes the hit, unless there are both friendly and enemy units within one inch, in which case one eligible unit from each side, of the opponent's choice, suffers a hit. Each engine gets one shot in each firing phase; any losses inflicted and/or morale checks caused by engine fire are assessed and carried out before any other missile fire. B) each melee casualty suffered, but ONLY if it was not already forced to retreat as a result of melee resolution. Morale checks are made at the end of the phase in which the losses were inflicted (exception: see engine fire above). Morale points and modifiers are given later in these rules. Retreats are made towards the friendly edge of the table as much as possible. Units never retreat of the field (table). Units surrender only if surrounded by enemy troops and required to retreat. 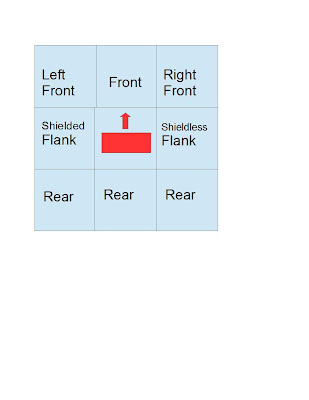 Morale Checks are made by rolling %tile dice; if the result exceeds the modified Morale Point of the unit, the effect depends upon the degree by which the roll exceeds the modified Morale Point; if several checks are required, only the worst result is applied. Note that a six figure unit which suffers four hits would check for the third and fourth hits counting the modifier for having lost a stand. Retreated units move normally subsequently, except that if they move in the very next movement phase only, they may not move into melee contact. In addition, Elephants and Levy which wish to attack under normal circumstances must make a special morale roll; if they fail, they do not retreat or take hits, but may not move into melee contact on that movement phase. They may till move normally otherwise, and may defend and shoot normally as well. If Elephants fail any OTHER morale check, , they retreat as usual, but if they interpenetrate any friendly unit(s), they will fight a round of melee against it, with the friendly troops unable to reply. No melee resolution roll is made, BUT the affected unit must still check morale as usual if it suffers any hits. C) they are defenders with an enemy to their 1) Front, 2) Left Front, or 3) Right Front, and they choose to participate in melee. In this case, the defenders melee factors MUST be applied to the enemy unit occupying the lowest numbered position in the preceding list. NOTE: If there are one or more enemy units facing into the attacker's (moving player's) square (hex), the attacker's unit MUST face into one of those squares (hexes). If the units move allowance is insufficient to fulfill this condition, the unit may NOT attack from that hex that phase. Units attacked from their flank or rear, but with no units to their front fight their attackers, but do not change their facing. Each unit in a melee determines the enemy unit it is fighting as above, and then figures out its modified melee factor against that unit. Note that situations where unit A fights X, and unit B fights Y, while on the other side X fights B and Y fights A will not be rare. Each stand involved in the melee then rolls %tile dice; a roll equal to or less than its modified factor is a hit upon the enemy; factors over 100 mean one automatic hit and a % chance of a second hit. If an enemy unit is eliminated and there are still more stands to roll against it, such defending units MAY elect to roll against the next unit on their priority list.For the purpose of resolving the order of attacks within a melee, units fighting a common opposing unit roll in order of their modified melee factors, highest factor first. * Note special rules for Lance.Pike,and EHC. El and Ch are never considered Shieldless; Pikes and 2-Handed are always considered Shieldless. In any case, following simultaneous removal of casualties, the modified factors as actually used are totaled for all surviving stands involved in the melee on each side, and the larger total divided by the smaller to obtain the Victory Quotient (VQ). The VQ is looked up on the table, rounding down, and %tile dice rolled. If the roll is less than the score listed, the side with the higher total wins; if it is greater, the side with the lesser total wins. The results listed on the table are applied, with the hits being distributed as logically as possible. All units which lost one or more hits in the melee, and were not already required to retreat as a result of the melee resolution roll, must then check for morale for each casualty suffered in the melee. Do not forget the penalties for units which were Disorganized as a result of being attacked in flank or rear,, or by terrain, etc. # = face with backs to enemy! Units which remain in melee after the above may not fire or be fired upon Units is such a carried over melee may, on their own move, remain stationery and change facing, or they may retreat from the melee. Units retreating from a continuing melee may not make an attack on the same move. The value of lance and Pike in the second and subsequent rounds of a continuing melee drop to short spear and long spear respectively. EHC in the second and subsequent rounds of a continuing melee, and/or when attacked from the flank or rear count as HC; in all other circumstances they count as SHC. 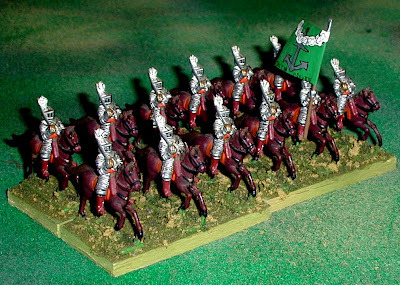 A) Any cavalry or chariots within 4 squares (hexes) of an elephant or camelry unit, or within 1 square (hex) if such units are found on their own side, are first degree Disorganized. 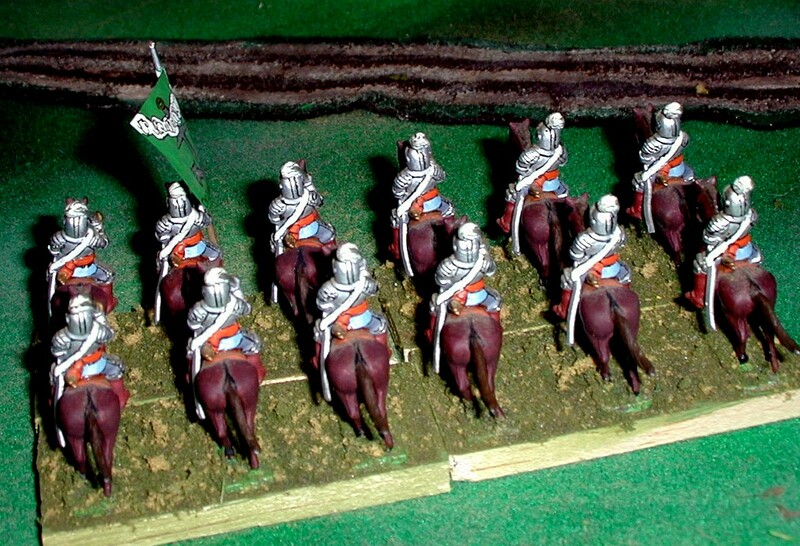 B) A cavalry or infantry unit is first degree disorganized if it fought elephants or chariots on the previous move. C) most units contacted in Flank or Rear are second degree Disorganized, except Phalanx (pike) units, which are fourth degree Disorganized. Chariots are only Disorganized by attacks from their rear, and Elephants are never Disorganized by attacks from any direction. D) terrain can also Disorganize units passing through, standing in, or attacking into it. Defending units are never Disorganized by terrain their opponents are occupying. Degrees of Disorganization are cumulative up to a maximum of four, but is/are removed when the cause(s) of the Disorganization no longer apply. Generals move like Heavy cavalry, except that they have unlimited free changes of facing. Generals improve the Morale, Firing, and Melee capability of units they are with. A general must check for each melee or missile fire (but not morale inflicted) hit suffered by the unit that he is accompanying a roll of 96 or more kills him. The General must also check if he is within 1" of a catapult shell but is either alone or the unit that he is attached tio does not suffer a hit from the shell. If the unit the General is accompanying must retreat, the General must retreat with it. Once the number of pieces for eac section of the table has been determined, roll on the table below to determine their nature, and place them randomly within the 2 x 3 foot sector. A piece of terrain is 2 adjacent squares (hexes) of woods, marsh, hills, works, or houses, 3 squares (hexes) of sand or lake, or roughly 3 feet of road or stream. Marsh and Sand are treated as Woods for game purposes, except they never give any sort of cover or protection in melee; Camel mounted troops treat sand as Open terrain. Roads will generally connect to table edges and/or houses; wherever a roasd crosses a stream, a bridge is placed. Special Rules: Flamethrower unit is a single stand and takes only 2 hits. It has a range of only 2 squares (hexes), but has a fire factor of 80% against ALL targets. Target checks morale with a penalty of -10; -20 if Chariot, Cavalry, Camelry, or Elephant. The Flamethrower has no melee combat factor, and is destroyed if forced into melee. However, any unit attacking a flamethrower must undergo a flame attack (and morale check if it suffers a hit) once it reaches 2 squares (hexes) range, unless it attacks from the flank or rear. The Flamethrower my use skirmish retreats also. Elephants are first degree Disorganized within 2 hexes of a flamethrower. 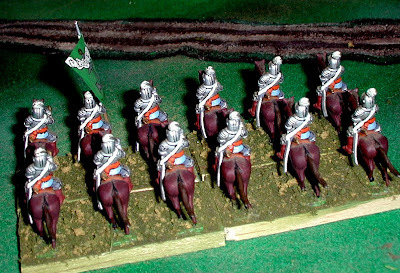 This list was made at last as much to match my old Minifigs "Alexander Nevsky" range Teutonic Knights army as much as to be historically accurate, so be forewarned! Obviously, many other armies and army lists can be adapted for use these rules. We have had a lot of fun playing with these rules and armies over the years. Each list is set up deliberately to have a bit of a flavor unto itself, with that taking precedence over the strictly historical when necessary.